The dissolution of Myshall’s 1798 committee in March 1999 saw the birth of a new organisation Myshall/Drumphea Millennium Committee. Its aims were to arrange a programme of events for Myshall for the year 2000 and to co-ordinate projects of interest for the many age and interest groups present in the parish. 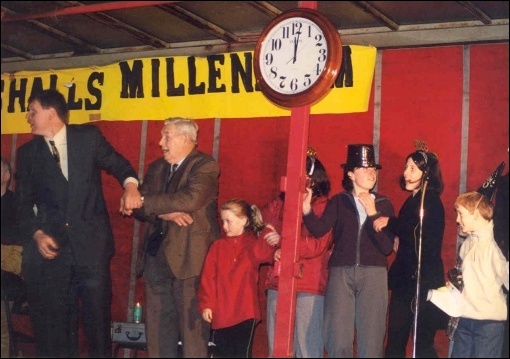 Our first major event was the launch of a calendar highlighting Myshall’s proudest moments in the last number of years and then from 11 p.m. on 31st December 1999 to 1 a.m. on January 1st 2000 the committee held a huge ‘once in a thousand years’ celebration on the street around the pump. Those present held lighted millennium candles and wrote their names in a Millennium Record Book provided so that future generations would know exactly who was present to welcome the Millennium to Myshall. Greetings from President Mary McAleese were read, there was a ‘Tale of the Century’ hailing local events interspersed with entertainment from young and old alike and Jim Nolan well-known local raconteur made up a recitation especially for the occasion. A wonderful Myshall/Drumphea ‘Hamper of the Century’ that had been compiled by the committee from memorabilia of the area was raffled. As the clock struck midnight white balloons were released together with a white bird of peace, there was a millennium blessing for all and the excitement intensified with a fireworks display, music and dancing. The atmosphere was unforgettable with all present hugging one another and wishing one another everything possible for the New Year, New Century and New Millennium. As time passed each month was marked with a specific millennium project e.g. the Senior Citizens launched a ‘Back in Time’ Video, Myshall N.S. completed a millennium mural, Myshall I.C.A. 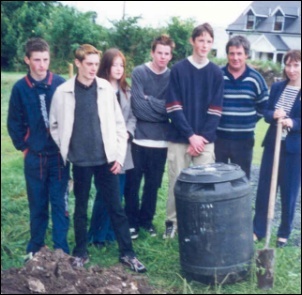 organised a Rural Show, the Foróige club buried a Time Capsule and a Millennium People of the Year Awards night took place. Mementos specially commissioned by the committee were given to: the parish’s millennium baby, each Senior Citizen, each child who received a sacrament, each finalist in the 2000 Parish Card Drive and each winner of the People of the Millennium awards. The mementos featured St. Finian’s Church Ruins the oldest symbol of Christianity in the parish and the words Myshall and Drumphea 2000. Conscious of the Jubilee 2000 connotations our committee also organised a number of religious celebrations e.g. Myshall Prayer Group erected a Millennium Cross in the grounds of the Church of the Holy Cross, a twinning took place between Clonard in Co. Meath and Myshall as both have St. Finian as their patron and a ecumenical ceremony took place in the beautiful Adelaide Memorial Church. 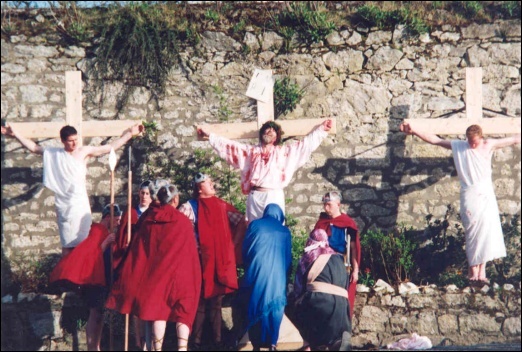 One of the most emotional scenes ever enacted in the area was the Passion Play held on Good Friday and staged out of doors in the vicinity of the Community Centre. A large crowd watched in silence and awe as the cast of about 40 locals acted out the Last Supper, Garden of Gethsemane and the Crucifixion with great emotion and pathos.